The technology is captivatingly simple, allowing the production of pure hydrogen from biomass at room temperature. 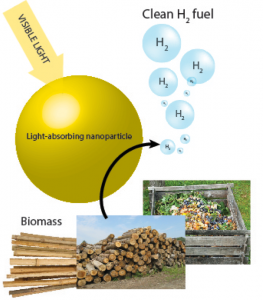 Using a patented catalyst which is activated by sunlight, lignocellulose and other biomass can be converted directly to high-purity hydrogen gas, with only a few parts per million of carbon dioxide and carbon monoxide as contaminants. The challenge for the i-Team is to find a market need for this particular method of producing hydrogen on a relatively small scale. Commercially it is easier to produce hydrogen directly from fossil fuels, and more efficient to convert biomass to methane rather than hydrogen. There are also questions around the compression, storage and safety of the hydrogen gas which the system can produce. Possible uses include fuel cells, direct grid injection of electricity and a range of developing world applications (e.g. local production of electricity for off-grid mobile phone base stations). The i-Team will need to speak to experts in the hydrogen economy, the biomass sector, the off-grid power sector, and also to people with experience in developing world projects and the market for hydrogen fuel cells, and find a convincing case for one or more applications where this technology would be the best fit.